by Stacey Berlow of Project Balance. Stacey co-facilitated a session on a Gender Based Violence Information System in Zambia at MERL Tech DC. A big thank you to our client, World Vision, and to Yeva Avakyan, Head of Gender and Inclusion at World Vision USA, for inviting Project Balance to participate in the recent panel sessions at MERL Tech and InterAction. 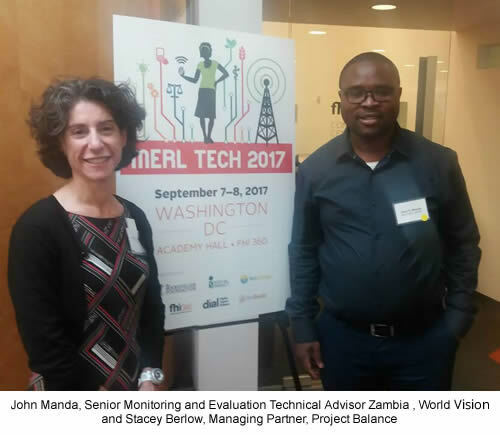 We participated on the panels with World Vision colleagues Holta Trandafili, Program Quality Specialist and John Manda, Senior Monitoring and Evaluation Technical Advisor Zambia last week (September 6-8th). The sessions received a lot of great feedback and participation. Yeva and her team put together this impactful video about the prevalence of gender based violence in Zambia and how One Stop Centers provide needed services to women and men who experience violence in their lives. World Vision works in close collaboration with the Zambian government to roll out gender based violence support services. 37% experienced physical violence within the 12 months prior to the survey. 31% report having experienced such violence in the past 12 months. Among ever-married women who had experienced IPV in the past 12 months, 43% reported experiencing physical injuries. 10% of women reported experiencing violence during pregnancy. 9% of women who have experienced violence have never sought help and never told anyone about the violence. Norms that teach women to accept and tolerate physical violence, and teach men that it is normal to beat his wife. An occasionally connected system was built that allows facilities to enter and save data as well as run reports locally and when there is an internet connection, the data automatically synchronizes to a central server where data from across all facilities is available for reporting. A participant asked John how data collected was used and if technology positively impacted the program. John gave some concrete examples of how the data showed differences in the number of people receiving certain types of services between facilities and regions. The Zambian team asked “Why the differences?”. This led to analysis of processes which have been adjusted so that survivors can receive medical and psychological help as soon as possible. The technology allows trends to be identified earlier through automated reporting rather than having to hand calculate indicators at the end of each reporting period. As the technology provider, we were excited to hear that the GBVIMS is being actively implemented and program participants and managers are using the data for decision making. It’s wonderful to be part of such a passionate and professional team.